Cinco De Mayo is coming. Someone asked me once, "When exactly is Cinco De Mayo." I tried not to giggle...and sweetly responded that it was the 5th of May. Cinco. De. Mayo. It's a Mexican holiday and a lot of folks here in the desert Southwest celebrate it with food and festivities. 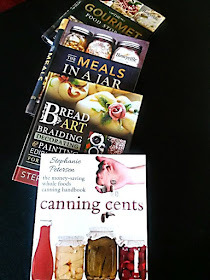 Ironically, one of my darling-sweethearts-of-a-friends, henceforth known as "JJ" on the blog, won a personal cooking class from me a while back. Friday, we finally got together here at the CTB Test Kitchen. Do we call that a little TCB with CTB? Can I get a fat ring like Elvis had? At any rate, JJ got to work really hard play with me. Her request, "Can I learn how to make stinkin' delicious enchilada sauce like my Mother-in-law makes?" Um...no pressure. I have no idea what her MIL's sauce is like, but I did get to show her mine. Mine is actually a cross between a Mole Sauce and an Enchilada sauce. It's pretty unique. I don't use fruit or nuts that are usually found in mole, but I do use some hints of cocoa, sweet spices and hot beautiful Ancho Chili peppers. My husband Ace drinks this stuff like a smoothie. I'm not claiming he's all that bright, but he's a die-hard fan of this stuff. He has it over his bean burritos "enchilada style". It's evil delicious. Do you want to make it with us? Okay. True confession. This is the first time I've ever shared the recipe. So feel special. Here you go...Weeeeeee. Directions: In a spice mill, grind the chilies. Add the cumin, pepper and oregano. Pulse until they are a smooth powder. Combine all all the spice blends and cocoa with the freshly ground chile mixture. In a gallon size pot over medium heat, saute the onions in olive oil until onions are transparent, about 5 minutes. Add the minced garlic the last 2 minutes of cooking. Stir quickly and let the starch in the flour "cook out" about 3 minutes. Get the chicken stock and the tomato sauce. Slowly pour the chicken stock into the pot, stirring with a whisk to avoid lumps. Add the tomato sauce. Simmer 10-15 minutes until the sauce thickens and lightly covers the back of a spoon. Stir in the fresh lime juice and zest. Use right away for homemade enchiladas or chill and use later for ...um...enchilada smoothies for Ace. Brown the beef, onion, and garlic over medium heat until crumbly and ready to fill tortillas. Another fast favorite is to just use my favorite taco TVP for vegetarian husband...who frankly can't tell the difference between it and beef. I soften my tortillas in a simmering skillet of lightly salted water. This is not traditional, but there are some who use a hot oil to soften the tortillas. Frankly I need the lower fat version. Put one cup of the prepared enchilada sauce on the bottom of a 9 by 13 casserole. Soften a tortilla in the hot water, about 30 seconds. Don't go too long or it will get too mushy to work with. Fill with some meat mixture and roll. put them in your pan seam side down and tuck them tightly together. When all the rolls are done, top with the remaining sauce. Sprinkle with cheese and bake at 375 degrees 25-30 minutes uncovered. Cheese will melt an get gooey. Use caution when scooping the molten cheese beauty into your mouth. Seriously. Dangling cheese from your lips is sooo unprofessional. Hilarious yes. Scoop onto festive plates and drip any extra sauce from the pan onto the enchiladas. There you go! 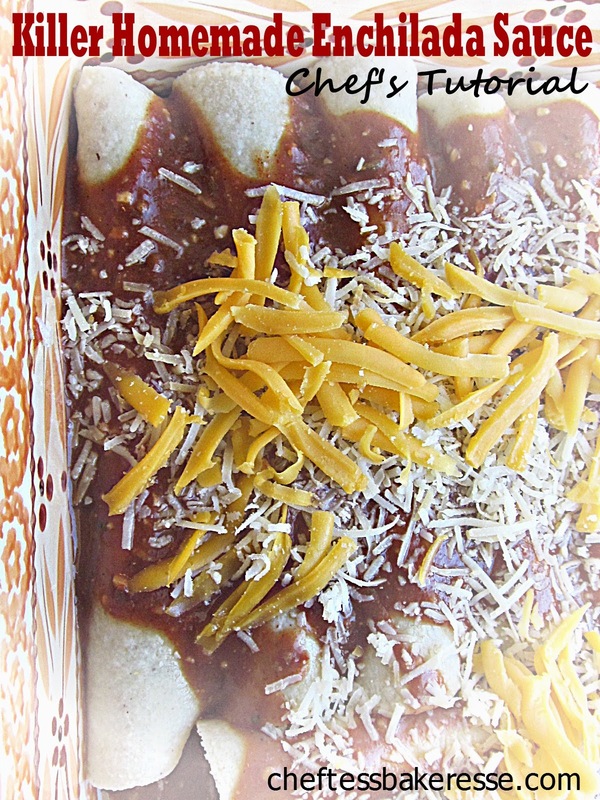 Make some crazy delicious enchiladas! JJ tells me her family devoured the entire pan. I'm calling that a win! Ahhh. I think a meal in a jar for this could be arranged. Spooky that you would say it. Xoxo!